A Slicer is an interactive control. A Slicer makes your job easy to filter data in a pivot table. The following figure shows a pivot table with three Slicers, their headings are: AcctType, OpenedBy, and Branch. Each Slicer is containing a particular field. In our example, the pivot table is displaying data for Savings account, Opened by New Accts at the Central branch. Showing a pivot table with three slicers. The data in the pivot table is filtered by these three slicers. Filtering what we do with Slicers can be done by using the field labels in the pivot table, but Slicers are targeted for those who might not understand how to filter data in a pivot table. You can also use Slicers to create an attractive and easy-to-use interactive “dashboard”. To add one or more Slicers in your worksheet, select any cell of your pivot table and then choose Insert ➪ Filter ➪ Slicer. 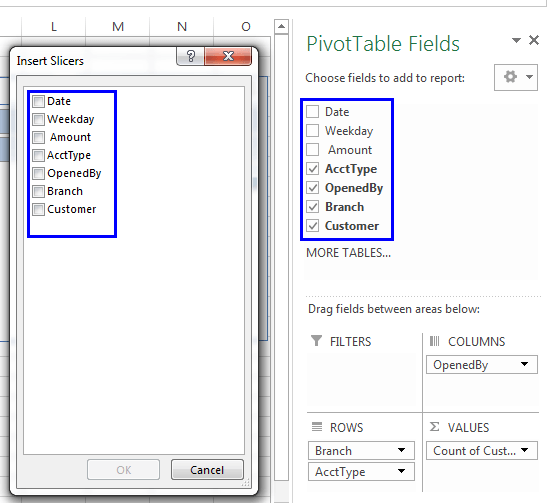 The Insert Slicers dialog box will appear, with a list of all fields in your pivot table. Place a check mark next to one or more Fields, and then click OK.
Insert Slicers dialog box. This dialog box has the same fields when compared with the PivotTable Fields task pane. New Feature: In Excel 2013, Slicers are no more limited to pivot tables. The slicer can also be applied to a table (created with Insert ➪ Tables ➪ Table). You can move and resize Slicers. You can change the look of Slicers too. Click the icon in the Slicer’s upper-right corner to clear filtering you have applied in the Slicer.